Wolfski offers art for your own individual or personalized tastes and also books. We produce caricatures, cartoons, portraits, fine art, illustrations, web design and murals. Our artists can draw great caricatures of yourself and your future spouse in a unique wedding banner, which can also be used on your invitation cards. We can produce caricatures for all occasions; little league sports events, sports and hobbies, caricatures of pets, caricatures next to favorite cars, caricatures of the office and office events, cheer leading caricatures and so on. In 1988 Wolfgang Niesielski had the idea of establishing art studios that could produce various kinds of art for individual customized needs and for all kinds of tastes. Wolfski produces customized, individual and specialized art and caricatures for gifts, cutouts, presentations, illustrations, murals and parties. We also supply limited edition fine art and cartoons for all occasions. 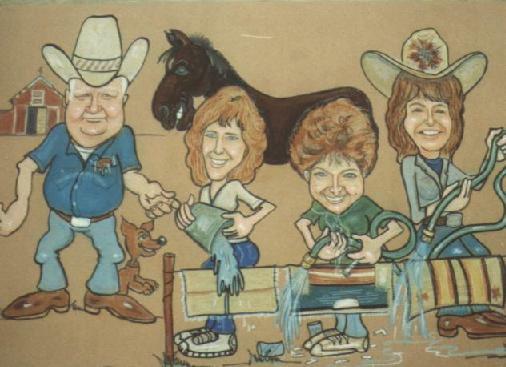 You can have your caricature drawn from photographs, for wedding banners, retirement parties, and other occasions, and on gift items, such as T-shirts, mugs and mouse pads.